Why Are Pierce-Arrows so Interesting? On the long weekend of August 24-26, 2018, the Pierce-Arrow Museum at the Gilmore Car Museum in Hickory Corners, MI will again be a focal point of this annual Pierce-Arrow Society Meet. Our two full tour days will again have new sights to enjoy, but we’ll also enjoy favorite spots from earlier years. 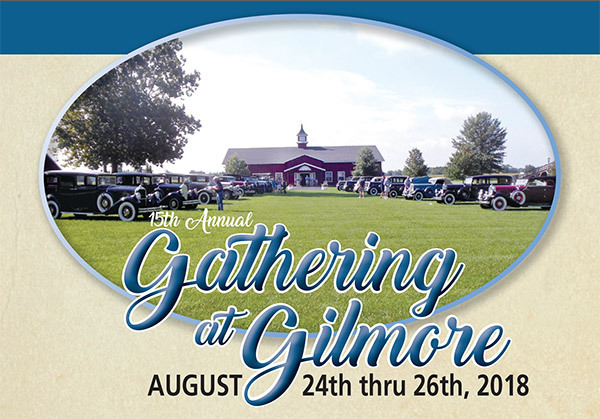 Join fellow Pierce-Arrow Society members ‘Gathering at Gilmore’ to celebrate, socialize, tour in and show our special vehicles to each other and to an interested public. Bring your Pierce, ride along, or drive modern, but come have fun…and Ice Cream! The West Michigan area offers a blend of country scenery, rich history, quaint villages, good low traffic country roads, art and antique shops, attractive lake and river waterfronts, interesting history, neat private car collections, occasional boat rides & great food. If you haven’t yet been to the Gilmore Car Museum and your Pierce-Arrow Museum in Hickory Corners, MI, this is an opportunity to visit the best automotive museum complex in the world. CCCA, Cadillac, Franklin, Ford Model A and Lincoln clubs also have their museums here with over 400 vehicles on display on beautiful park-like grounds. Gilmore is just NE of Kalamazoo, MI and only 13 miles off both I-94 and I-131. Earlybirds will enjoy an event Thursday evening the 23rd. In 2018 both Friday and Saturday Tours will go to the Lake Michigan shoreline visiting always popular resort towns of Saugatuck and South Haven. As usual tours will include car collections, museums, scenic rural roads, attractive small towns, and excellent restaurants as we venture west to visit a variety of interesting venues. Wine, antiques, shopping and photo opportunities will be found along the routes. The Friday & Saturday tours will begin and end at the Comfort Inn. We’ll have trailer parking and a designated parking area for Pierce-Arrows. The Friday Dinner will be at the Four Roses near the hotel. The Saturday Banquet will be at Comfort Inn. The PAS Sunday Show Day for the public is on the green in front of the Pierce-Arrow Museum. Following an awards luncheon in the Pierce-Arrow Museum we’ll have time for visiting the other museum buildings on the Gilmore campus. Come enjoy the people, scenery, history, car collections, antiques, shops, food, wineries and many fabulous vehicles. Room reservations can be made now, but the block ends August 1. Registration Forms will mail to previous attendees in April, inserted in a PAS mailing and be posted on the PAS website Announcements and Activities areas. Put this fun event on your calendar now. You’ve read about it in the Arrow. First enjoy the Annual Meet in California. Then at the end of summer, come enjoy an extra helping of Pierce-Arrow Society fun touring in West Michigan. Ask anyone who’s attended before! A new addition to our outstanding collection! Copyright 2019 Pierce-Arrow Museum. All Rights Reserved.